Savor the experience of Central Europe’s gems along the Rhine, Moselle, and Main Rivers, and continue your ad-venture with wonderful visits to Paris and London. Begin your European river cruise vacation in “The Golden City” of Prague. See the Hradcany Castle grounds, St. Vitus Cathedral, and Old Town’s Astronomical Clock with guided sightseeing in the spectacular capital of Czech Republic. You’ll transfer to Nuremberg to board your Avalon Suite Ship® and take a tour of the city’s medieval architecture and amazing sights. Sail to Bamberg to see the home of imperial dynasties. 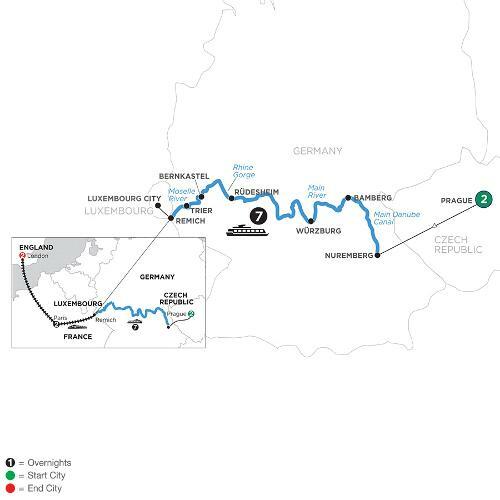 Next stop is Würzburg— the “Pearl of the Romantic Road.” Then sail to Rüdesheim, and cruise through the spectacular views of the Wachau Valley to the wine village of Bernkastel. Your next stop will bring you to the ancient city of Trier. Along the enchanting Moselle River, make your way to Remich, Luxembourg to disembark from your Avalon European river cruise, and transfer via high-speed train to Paris to start your Monograms vacation. You’ll enjoy VIP sightseeing in “The City of Light” with an expert guide drive past the Latin Quarter, Les Invalides, Place de la Concorde, Eiffel Tower, and the Arc de Triomphe, followed by a Seine river cruise and free time to enjoy with the suggestions and support of your Monograms Local Host®.